My cravings are rebellious. Pre bun in the oven days, I could have cared less about tuna salad. I ate it maybe twice a year. Post bun, I dream of tuna salad. Tuna salad on crackers, tuna melts, tuna salad salad…but tuna is a preggo no-no. I can have it once a week at the most, due to Mercury levels in most fish. Monday is tuna day. I wait for it. The last Monday tuna day was “kitchen sink” tuna: Celery, Persian cucumber, grape tomatoes, pickles and onions all chopped into tiny pieces, mixed with tuna and Trader Joe’s Cilantro Chive Yogurt Dip (instead of mayo). Gorgeous! I think part of the reason the tuna craving is so strong is because it’s one of the only protein sources that sounds good. Right now the majority of my protein comes from yogurt and cheese. However, I’ve found a new protein love. Fried eggs! I’m limiting myself to two a day (cholesterol), and am sure this craving will pass (we’ve already been through the cheese, cracker and pickle sandwich phase and the bagel with cream cheese phase). The picture you see above are Western Eggs, made by my wonderful husband. Western Eggs and pancakes are my dad’s signature dishes, and I’ve been eating them since I can remember. Husband, dad would be VERY proud, and a little threatened. 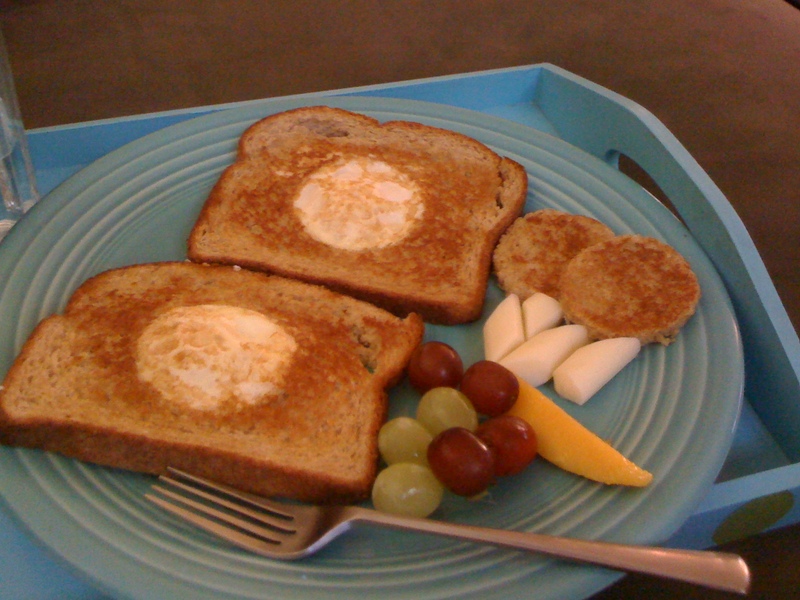 Western Eggs were my mom’s specialty, but I grew up calling them “Toad in a Hole.” Either way, they are delish. Glad you found a new protein source! Toad in a hole is a better name, methinks, but must call them what dad calls them. Love you! Make salmon salad with TJ’s canned salmon! 98% as good as tuna, full of Omega-3s and free of mercury worries–I am eating it twice a week with pickles, scallions, and fresh dill. So yummy!! Pregnancy cravings are the weirdest things! One day you’ll look back and laugh at what you ate when you were pregnant. But no matter how good it sounds at the time, DO NOT under any circumstances eat a footlong chili dog at Weinerschnitzel. I’d never eaten there before or since. I don’t even eat fast food! HAHA! PS. Toad in the hole is also an English sausage dish. We called what you made Peekaboo Eggs. 🙂 Guess there are lots of names for it.